Who doesn’t salivate at the sight of Chinese noodles? I’m sure you’ll drool whenever a Chinese roll noodles strings in an amazing way! 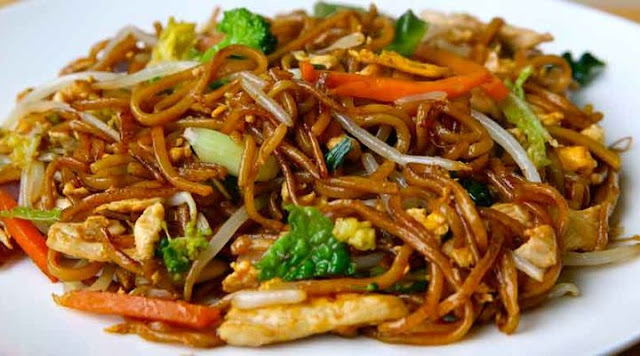 Chinese fried noodles is an easy, a quick and delicious recipe that you’re certain to savour. You can add cooked chicken, diced beef, or vegetables to improve the taste. RELATED ARTICLE: Akara and Pap. Twenty minutes cook time; to be ready in no less than four minutes. - Boil the ramen noodles for about three minutes until it is softened. Boil without flavour packets. Reserve the flavour packets, drain the noodles and set aside. - In a small frying pan, heat a tablespoon of oil and scramble the eggs in a bowl. Cook and stir the oil and then set aside when firm. - In another frying pan, heat I tsp of oil over medium heat. Cook the green onions and stir in oil for about two to three minutes. Continue doing this until it is softened. Transfer this to a separate plate and set aside. Heat another teaspoon of oil in the same frying pan and cook and stir the peas, carrots and bell peppers. Set them aside when done. - In a separate frying pan, combine 2 tablespoons of sesame oil with 1 tablespoon of vegetable oil. Fry the noodles in oil for about three to minutes over medium heat. Turn regularly. Sprinkle sesame oil, soy sauce and some of the reserved ramen seasoning packets over noodles. Add vegetables, turn frequently and continue to cook for another five minutes. And your Chinese Fried Noodles is READY!!! Serve with fried chicken, beef, fish or boiled egg.